If you’d worked in the same role since 1992, most people would want a change of scenery. But Katito Sayialel, Research Assistant & Field Operations Manager for the Amboseli Trust for Elephants, is not ‘most people’. As Research Assistant, Katito monitors the famous elephants of Amboseli – a role that involves the regular collection of group sightings data, estrous and musth records, censuses of families and independent males, and the collection of identification pictures. And after 26 years, she still loves every single moment. The Born Free-supported Amboseli Elephant Research Project, based in Kenya, is the longest running study of wild African elephants in the world. Research from the project has provided valuable insights into the behaviour and intelligence of African elephants that can inform the conservation of this species. 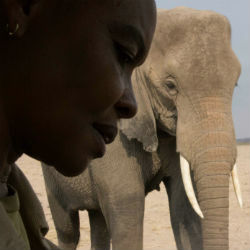 Katito spends six days a week out in the field, monitoring the elephants she has come to know so well. And no two days are the same. “The time we head out depends on what the elephants are doing,” Katito explains. “In the dry season they can move to the swamps very early in the morning, so we have to be out early, too, to catch them before they go where we can’t follow. We have lots of sneaky routes to catch them, but sometimes they still manage to go a different way! “We spend the morning checking on all the elephants in the area, or responding to calls from the community. In the afternoons, we upload photos, check data and start the process of data entry. Sundays are usually the only day we don’t get out in the field,” she adds. 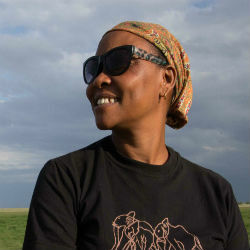 Katito has also worked with many filmmakers over the years, using her excellent knowledge of light and elephant behaviour to help them capture the perfect shot and make Amboseli’s elephants famous. Her dedication and commitment to her role makes her a true Wildlife Hero. But she is fully aware that those on the front-line of conservation need the full support of politicians. Governments, she says, need to “get serious about the laws wildlife needs to keep them and their habitats safe”.